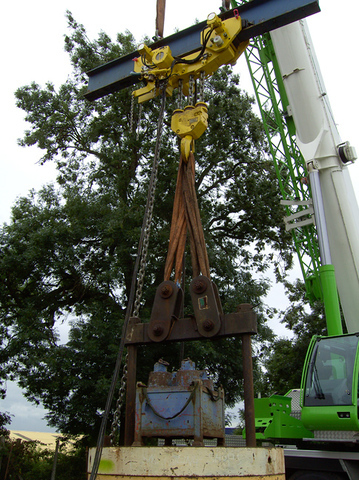 Hoist & Winch Ltd carry out onsite service, inspection & repair work throughout the UK on all types of electric, air, manual and sometimes hydraulic powered hoists and overhead cranes. This work covers a very broad spectrum of industries and includes working for various blue chip companies including: Environment Agency, Cemex, Hanson Cement, Akzo Nobel, Nuplex Resins, Sun Chemicals, Vinnolit, KP Foods & Sygenta. As the above customer list indicates, we are particularly at home working on sites where the conditions are harsh or of a hazardous nature, and include both electric and air powered explosion proof cranes and hoists. Equipment brands Hoist & Winch Ltd work on include: Yale, Tractel, Kito, Demag, Verlinde, Donati, Stahl, Italkrane, Ingersol Rand, JDN (J D Neuhaus) & RRI (Red Rooster). In several cases where there are a large amount of cranes, hoists and loose lifting tackle involved, we have assisted the customer by first conducting a detailed site survey and compiling a comprehensive inventory of the equipment to be serviced/inspected, alongside the required service/inspection intervals. As part of this process, we include discussion with the customer and his operatives on the utilisation level of the equipment concerned, and tailor a service and inspection regime to suit the usage of the equipment and any particular issues relating to specific applications. Access to the equipment to be serviced can be from local fixed access platforms, temporary fixed scaffolding, temporary mobile scaffolding, mobile stairway or MEWP. Our site engineers hold IPAF licences for MEWP operation, PASMA certification for mobile aluminium scaffold tower erection, COMPEX trained to work on ATEX electrical equipment, CCNSG Passport To Safety and Height Safety Harness Training certification. Other site specific certification or training for our site engineers can be arranged to suit a customers' particular needs or requirements. In all cases, site specific Risk Assessments and Method statements are issued and agreed prior to each site visit. Onsite Service, Inspection & Repair Of All Types of powered and manual Hoists, Overhead Cranes & Loose Lifting Gear.